V-Rally 4 can be fun, for those who remember this series from back in the day, otherwise it’s a useful litmus test of just how far (or not) nostalgia can take a game. V-Rally 4 feels like a game that is gloriously out of time in the current generation of gaming platforms. In a world where racing sims like Forza and Gran Turismo seem to dominate, an old-fashioned, straight forward arcade racer feels like something of a throwback. The only arcade racing franchise a Triple A publisher has been producing with any regularity in recent memory is EA’s Need For Speed, and thanks to developers plugging an open-world structure, and unnecessary plot and pay-to-win mechanics into it, the wheels came off that series last year. The cars in V-Rally are lightweight and skittish when compared to vehicles that feature in other games; they’re more prone to bounce all over the track than hug the road and thanks to the aggressiveness of the AI, races can sometimes feel more like sword-fights where players parry and look for an opening rather than hone their skills behind the wheel. The core of V-Rally is its campaign, and while it’s a fairly lengthy affair, it also feels pretty listless in its design. Split across five different racing disciplines, the mode sees players start off with a rally car and then over a series of races they earn enough in-game money to start unlocking more cars – allowing them to compete in different disciplines. It’s a formula that’s been used before – just look at The Crew or Need For Speed: Payback – but rarely has it been handled in such a pedestrian way as it has here. Instead of raucous cut-scenes or some sense of personal progression, players manage their pit crew, garage and finances through a series of menus. It feels less like a personal journey and more of a battle to build stats. This may be because the developer didn’t have the budget of games V-Rally is in competition with, which is understandable since this game is a sequel that arrives 16 years after the last instalment in the franchise – and that was two console generations ago. This may also explain the developer seems to have gone for a super-retro feel, but for current racing players, it may be that V-Rally has too much ground to make up. And that’s probably why this game can only be cautiously recommended. 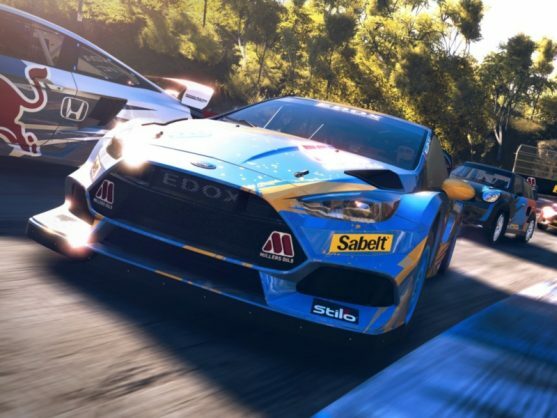 Fans of the current crop of racing franchises are more than likely to turn up their collective nose at V-Rally 4, thanks to its uneven handling, paucity of customisation options, uninspiring campaign and a list of vehicles that’s minute when compared to what other games offer. It can be fun, for those who remember this series from back in the day, otherwise it’s a useful litmus test of just how far (or not) nostalgia can take a game.